Michael Springmann was, to all appearances, your run-of-the-mill junior level consular employee, but he was not in a usual place, nor in a usual time. His government sent him to Saudi Arabia right as it was preparing for a battle royale with the USSR in Afghanistan. In this excerpt from his book, Springmann describes a consulate teeming with CIA personnel, and reveals how, as head of the American visa bureau, he was ordered not to follow his best instincts but instead to approve visas for all manner of dubious individuals. In retrospect, he realized he was witnessing the mujahideen pipeline — the flow of young fighters to take on the Soviets — the same people who later became al-Qaeda. Here, in anticipation of the 14th anniversary of the 9/11 tragedy, is the second of a three-part series of excerpts from “Visas for al-Qaeda: CIA Handouts that Rocked the World” by J. Michael Springmann (Daena Publications, Washington, DC LLC 2014). These excerpts have been edited and compressed. To see Part 1, please go here. While the Foreign Service is filled with people who do not work for the Department of State, Jeddah was my first experience with a majority-spook post. According to a former CIA station chief who asked not to be named, and Jay Hawley, a retired FSO (Foreign Service Officer), the average ratio of intelligence officers to real diplomats at a given Foreign Service post is about one in three. My experience in Jeddah, Stuttgart, and New Delhi might place it higher — at least one in two. I then tried Justice (given name) Stevens, head of the consular section. He told me to keep quiet and do what Freres wanted. 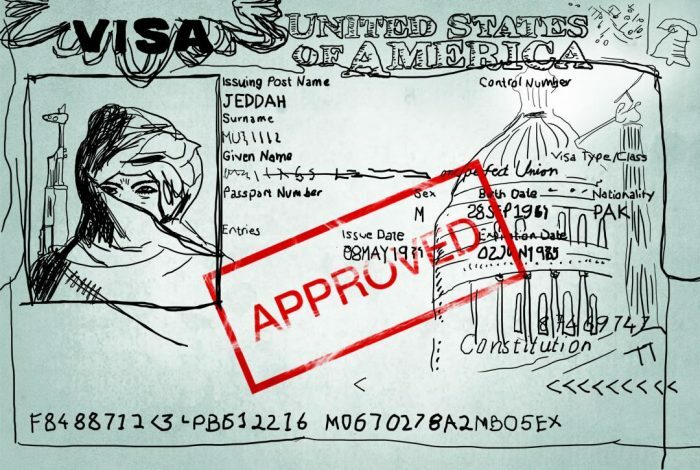 Eric Qualkenbush, the CIA base chief at Jeddah — whose cover was head of the Political/Economic Section — came up with a new demand: He or his staff had to examine and approve all visas that my staff and I had issued before the stamped passports were returned to the applicants. According to retired consular officers, this requirement was highly unusual. Another, who asked that I withhold his name, informed me that the CIA often trawled visa application files or sought specific information about visa seekers. I myself became suspicious of Qualkenbush’s nerve: Amazingly, he once made an unnecessary point of having me issue a visa to one of his Iranian contacts, an Oriental rug merchant in Jeddah. Eric stopped me one day on the compound and told me he was sending me one of his agents (foreign nationals recruited and controlled by CIA case officers), asking me to make the visa interview “look good,” because the CIA wanted the Iranian in Washington for consultations. Afterward, I thought, what was Eric doing making this request? The Iranian had a legitimate business, was going to the United States to meet real carpet buyers, and had been issued several visas before. Another little mystery. One question that I never addressed was, if a junior consular officer, such as myself, questioned the credentials of all the peculiar visa applicants, what were the far more experienced Immigration and Naturalization Service (INS) inspectors doing at the port of entry when these lowlifes entered the country? Two Pakistanis came to me for a visa. According to their story, they were traveling on a Commerce Department–organized trade mission to an automotive parts exhibition in the United States. However, they couldn’t name the trade show or identify the city in which it would be held. I denied their visa request. Within sixty minutes, Paul Arvid Tveit (now retired and living in Virginia) called and demanded visas for these same Pakistanis. I explained the reasons for my refusal, citing § 214(b) of the Immigration and Nationality Act (a visa applicant is an intending immigrant unless and until he can prove otherwise) and the Foreign Affairs Manual (FAM, State’s holy book that carries instructions for everything, including the requirement to refuse visas if there is any doubt as to the applicant’s bona fides). Ignoring the law and regulation,Tveit went to Justice Stevens and the visas were issued. Then, Karen Sasahara, the political officer and Henry Ensher’s successor, demanded a visa for a Sudanese who was a refugee from his own country and unemployed in Saudi Arabia. Following the letter and the spirit of the law, I refused. Sasahara immediately went to Justice, and a visa was issued. Besides staff going to Stevens (now retired and living in Switzerland), people from outside the consulate frequently went to Jay Freres to reverse my decisions. One individual, an expatriate company messenger with a stack of passports, appeared at the visa window one day, telling me I could issue the visas then and there, or I could do it after he went to Freres. Per regulation, the only way a refusal could be overridden was by a senior FSO with a consular commission, which Freres lacked. Additionally, the senior officer had to have information that was unavailable to the denying officer. Therefore, Freres acted without authority, also failing to make a required written report. Alcohol was a big deal in Saudi Arabia, where, if you drank and were caught, you were (1) arrested, (2) flogged, (3) deported. Yet, despite our efforts to “conceal” alcohol use at the consulate (by crushing bottles and beer cans, for example), the Saudis knew all about what the Americans were doing. One question that I never addressed was, if a junior consular officer, such as myself, questioned the credentials of all the peculiar visa applicants, what were the far more experienced Immigration and Naturalization Service (INS) inspectors doing at the port of entry when these unsuitable people entered the country? How is it that none of these undesirables were turned back? On the other hand … I well remember being told a story by Mike Carpenter, head of the consular section in Stuttgart in the 1970s. One of the applicants to whom he had given a visa had been sent home from New York. Although she had declared to the inspector that her US visit would be short, INS found a two-year supply of birth control pills in her handbag, thus indicating her plans for a much longer stay. Jay Freres did more than help questionable people get visas. He helped the Saudi government put expatriates in jail. Not long after I arrived and began making contacts around town, consular officers from two European consulates took me to lunch. Over good food and “Saudi champagne” (sparkling water, apple juice, and citrus slices), they asked for my help in identifying and publicizing the actions of a fellow of indeterminate nationality having multiple passports. They said this man possessed an arrangement with the Saudi government to import and sell liquor and drugs. According to my interlocutors, he would hold parties in alcohol-free Jeddah, generously supplying intoxicants, liquid and otherwise. As I understood it, he would then provide the names of his guests to the Saudi authorities who, on occasion, would raid the events, arresting as many attendees as they could catch. In return, he got to keep his profits (and stay out of jail). Subsequently, at one of the consulate’s “pool parties,” I happened to meet a man, an American citizen, who had been to one of the raided functions. He told me he ran out the back door as the police came in the front. Despite his age and physical condition (he appeared to be in his fifties and clearly out of shape) he said he got up and over the wall at the rear of the house faster than a teenage athlete. Learning about this scam, I felt I should post details of this mysterious dealer to warn American citizens in our consular district, the Hejaz. A simple notice, mailed to those registered with the consulate, would be the easiest way to protect our citizens. When I suggested this to Freres, as head of the consulate, he refused. He said it would offend the Saudis, and he ordered me to keep silent. While I didn’t work in Citizens Services at the consulate, which deals with the welfare of US nationals and handles any imprisonments, I still thought it only prudent, and my duty, to quietly pass the word to people I knew about this subject, Freres be damned. Michael Springmann (courtesy of J. Michael Springmann).